We welcome guest articles. If you would like to submit one, please use the "Contact Us" form at the top of the webpage. Please note that we are not able to print every article submitted. HIS SUNDAY used to be called Dominica in Albis (Deponendis), the Sunday for setting aside the white garments which the newly baptized were wearing all week because of their Baptism at the Easter Vigil service. Pope, now, Saint, John Paul II, in the latest edition of the Roman Missal for the Ordinary Form decreed that it be called Divine Mercy Sunday. I don’t think that anyone would deny that the world today needs God’s mercy. I like to define mercy as undeserved forgiveness for sins. And certainly the world today is guilty of much sin. I hesitate to say that it is more sinful than the past, but it certainly seems so, when we think of all the people killed in wars, genocide, abortions, and all the crimes against the holy state of marriage. We have no way of knowing which era was the worst, but ours certainly seems to stand out. Perhaps when we think of God’s mercy we tend to think more of individuals and God being merciful rather than God dealing collectively. And that is understandable. After all, when we die, we will not be judged collectively but as individuals. And it is there that we will especially be asking and needing God’s mercy. It seems that recent Popes, beginning with Pope John XXIII, are emphasizing God’s mercy more than other Popes. I purposely used the word ‘seem’ because I am sure that mercy was part of the message of all the Popes. After all when a Pope is writing what is God’s truth to us in some Encyclical, in the long run, he is showing us mercy by telling us the truth. Pope Paul VI’s Humanae Vitae was a document of mercy whether we liked its contents or not. People are suffering the dire consequences of not observing it. The Pope even predicted that they would. The Pope was being very merciful in forewarning them. One thing which gladdens me about the observance of Divine Mercy is the fact that in many places it gets a lot of people to confession. Most of them do this to gain the plenary indulgence connected to the observance of the Feast. I’m glad for that. I sometimes wonder why they aren’t as enthusiastic about gaining plenary indulgences on other days and at other times of the year. One can gain a plenary indulgence every day for oneself or for a departed loved one by various good deeds: 1) spending a half hour in Church in the presence of the Blessed Sacrament; 2) Making the way of the Cross; 3) Praying the rosary with another or in the presence of the Blessed Sacrament; 4) Meditating for fifteen minutes on our Lord’s sufferings. The other condition is receiving Holy Communion on that day and going to confession a week before or after. If you go to confession every two weeks, you are covered. 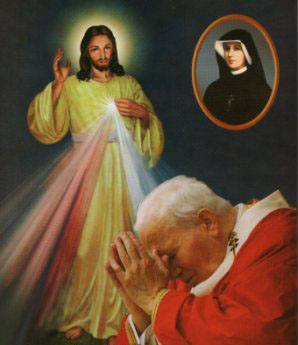 I’m happy that people want to gain the plenary indulgence on Divine Mercy Sunday. But remember you can also gain it on other occasions. Today’s Gospel is very unique in that the second part is used in the liturgical year the same time that it happened in the life of our Lord. The first part of the Gospel happened on Easter Sunday night. The second part happened eight days later, that is today (back in those days, they always counted the beginning and the ending day). The short passage of the first part has those memorable lines which give us the Sacrament of Penance, Confession or Reconciliation. I don’t care what you call it. It is the most concrete and definite evidence of God’s mercy that we could ever expect to have: to actually hear with our own two ears that our sins are taken away! Believe me; Jesus knew what He was doing, when He did it that way! That is why this Gospel is used every First Sunday after Easter regardless of the year or Form of the Mass. I don’t know if this influenced St. John Paul in picking this Sunday or not. I do know that when Pope Francis speaks about God’s mercy it is always in connection with confession, the sacrament of Penance. And remember this sacrament isn’t just to get rid of mortal sins. It gives us graces and helps to avoid sins and strengthen us. It increases our sanctifying grace. Frequently reception also makes us eligible to gain the main plenary indulgences that the Church offers. We are foolish if we do not take frequent advantage of it. We hope you enjoyed this homily by Fr. Valentine Young, OFM.